Remembering Alex Higgins ahead of the battle for the Dennis Taylor Trophy. And, yesterday, the Belfast Telegraph has published this good article, interviewed some of the players involved in today’s ROKiT Six Reds championship about Northern Ireland most iconic snooker son, Alex Higgins. When Stephen Hendry strides to the table at the Waterfront Hall tomorrow in the Senior Six Reds World Championship, he will receive the warmest of Belfast welcomes. And that’s just what you’d expect for the finest player ever to pick up a snooker cue who won a record seven world titles in his 1990s heyday. But there was a time when Hendry’s reception here would have been at best lukewarm, given that he had become the bête noire of Belfast’s favourite snooker son, Alex ‘Hurricane’ Higgins, who died in 2010. Hendry recalls: “I turned pro at 16 and Alex was brilliant with me. He always had time for a word of encouragement. I used to practice with him and that was amazing. “But as I became more successful and started winning a lot of tournaments things changed between us – I suppose we simply became rivals. “I seemed to replace Steve Davis as his No.1 hate figure! “It was sad really because Alex had been my hero when I was growing up. “But towards the end of his life when he was very ill I made a point of going to see him and I’m so glad that I did because he was brilliant with me and that meant so much. Hendry was the new star who freshened up the game in the 1990s. Hendry, like over 20 million others, had watched his television set enthralled as Dennis Taylor and Steve Davis slugged it out in the famous 1985 World Championship final at the Crucible, the Ulsterman winning the ultimate thriller on the very last black well after midnight. That was the game’s golden era when the likes of Davis, Higgins and Jimmy White – who will also compete at the Waterfront Hall tomorrow – where some of the most famous faces on television. But then along came Scottish young gun Hendry, taking the game by the scruff of the neck and winning the first of his record seven world titles in 1990 at the tender age of 21, the youngest player to wear the crown. If Davis was the man of the 1980s, the 90s was Hendry’s decade. His ice-cool demeanour didn’t always endear him to the public with the likes of Higgins and White – the Hurricane and the Whirlwind – blasting their way to the top of the popularity polls. But Hendry was the man, inflicting heartbreak after heartbreak upon White in particular, highlighted by four World Championship final successes against the Whirlwind, who was to endure a record six in all. White is still battling away on the main tour but Hendry hung up his cue in 2012 and currently works as a pundit for both BBC and ITV. And the Scot admits he can’t wait to get back into action in Belfast tomorrow in a quick-fire eight-player tournament that will be played in one day – with a £20,000 winner-takes-all prize. Legends Hendry and White will be joined by 1997 World champion Ken Doherty, surprise ’86 champion Joe Johnson, Tony Drago, Jonathan Bagley, Aaron Canavan and Dungannon professional Patrick Wallace. Four quarter-finals will be played in the afternoon (from 1pm) with the tournament played to a finish tomorrow night (from 7pm). Hendry says: “I have played at the Waterfront Hall before and it’s a great venue. “I remember playing Ronnie O’Sullivan there once and the place was packed, the atmosphere was electric. “It should be a great day. Hopefully there will be a big crowd and I’m sure we will put on a good show for them. “I haven’t played all that much of the Six Reds format but I know it will be fast and furious. It’s a big prize on offer so I’m sure the competition will be fierce. “I’m sure that the Belfast public will create a great atmosphere. And with the World Championship starting next month, Hendry feels Antrim cueman Allen – who made his triple crown breakthrough last year by winning the Masters – is among the big hopes. “Mark Allen has everything,” he says. “He has a different style than most other players. He is very exciting to watch. “His cueball control is superb and that enables him to score heavily when he gets in which is what sets the top players apart. “I’m surprised he hasn’t won the world title already. “The World Championship is a very different tournament to the rest. The Crucible is a unique venue. Some players don’t like the long matches which demand hours of concentration. “But Mark certainly has the bottle to do it and he has the game to go with it. I’d be surprised if he doesn’t win it at some point. Hendry – now 50 – regularly plays in seniors tournaments. “I enjoy playing in the seniors events, it’s great catching up with the other players again. I also love playing golf,” he says. “I do miss playing in the big tournaments on the big occasions, playing at the Crucible, but I don’t miss the seven or eight hours per day of practice. “Punditry work keeps me involved in the game. It’s not as good as playing but it’s the next best thing. “I do four tournaments for ITV and the three triple crown events on the BBC and I really enjoy it. White, too, cannot wait to get on the baize tomorrow. “It’s a fantastic format. I am not at the end of my career but I would say I am in the twilight of my career,” the Whirlwind says. “I am playing okay – my game is in good shape. “It will be a brilliant tournament and what an incentive – £20,000 for the winner. “I know I will have to be at my best with the likes of Stephen Hendry and Ken Doherty in the mix. “I would say that Ken and myself are the sharpest players in the field, simply due to the fact that we still play on the main tour. But the competition will be fierce. “Six reds on the table, best of seven frames – it will be very intense. It’s a short format that I really enjoy. “The Waterfront Hall is a brilliant venue, one of the best around. “Northern Ireland is a real snooker hotbed because of Alex Higgins and Dennis Taylor. “Joe Swail followed them and now you have Mark Allen who is one of the top players in the world. The game is in great nick in Northern Ireland and should be for a long time to come. “Barry Hearn is doing a brilliant job running snooker. If you are a young, talented snooker player today, you are going to make a lot of money – millions. “You used to hear players saying there weren’t enough tournaments. Now some of them are saying there are too many. If you don’t like it, take a holiday. No one is forced to play. “It’s great that people still cheer for me after all these years. People have always liked the way I attack, the way I go for my shots and take risks. “Ronnie O’Sullivan has a similar style and people love watching him as well. Also competing tomorrow will be the popular Drago from Malta. Drago, famed for his fast-paced play, reached the World Championship quarter-finals in 1988 and was previously ranked in the world’s top 10. This will be Drago’s first tournament since spending a month in hospital last year with a heart complaint. Former World Seniors Champion Charity Exhibition! 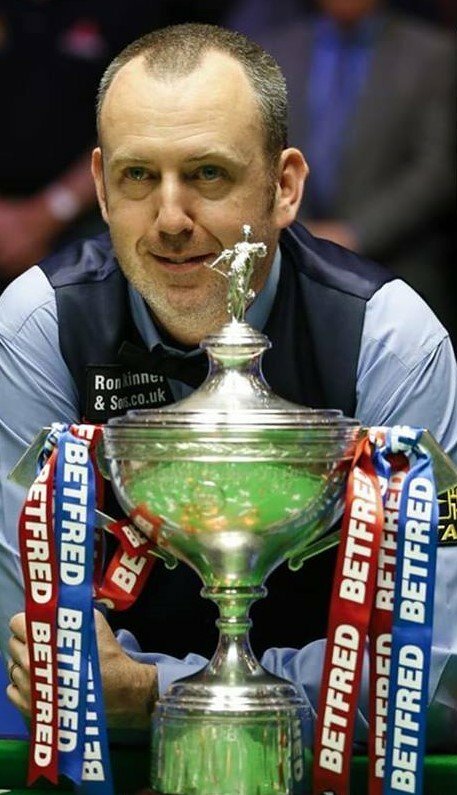 Mark Williams, who won the World Seniors Championship in 2015, at only 39 – and has been teased for it endlessly since – is doing a charity exhibition in Cleethorpes, on April 12, 2019. This was brought to my attention by Nigel Coton, a player competing on both the Disability Snooker Tour and the Seniors Snooker Tour. Thank you Nigel! Igor Figueiredo from Brazil wins the WSS World Championship 2019 – Q6 in Houston, Texas. The Seniors Tour is in Houston Texas for the sixth 2019 World Championship qualifying event of this season. It’s happening this week-end! The trophies were presented by the President of the U. S. Snooker Association, Ajeya Prabhakar. As it transpires, Houston is really a hard place ! One where you can get some mean soft shell crab, but lettuce is a rarity ! Action starts again on the World Seniors Tour in just two days. and those two proud Irish / Northern Irish have qualified for this event in the iconic Goffs bear pit! Good luck Patrick and Rodney! This is a special exhibition as it’s gathering money to support disability snooker. The man behind this exhibition is Nigel Coton, a disabled player himself. He knows how difficult it can be for disabled players to fund their participation in WDBS events, as many are on benefits and quite lonely. Nigel himself is not in that situation but he wants to help those less privileged because for many of those players, WDBS snooker is very important: it’s a place where they feel welcome and valued, and for some it’s even their only “family”. So, if you can, come and support this great event. There is only one VIP non playing table for five persons left, but there is still plenty of seats available in the arena. VIP tickets offer ringside seats, a Champagne buffet and the exclusive “meet and greet” reception before the main event from 16.30 to 18.30. The Arena doors open at 18.30 and the main show starts at 19.00 sharp. I will be at both events, in Goffs and in Lincoln … with my camera. Beware!